I think you've lightened the mood in this re-design through your choice materials and overall playfulness. I think its rendering style and choice of imagery also pertains back to the time period in which the decanter became popular. The playfulness also talks about the the idea of social drinking being a carefree enterprise. I feel like you've also applied a narrative to this postcard that is nostalgic and antique. In terms of noise, I find it odd that there are two bottle of liquor—the bottle on the table and the bottle in his hands. Other than that, I think this is a really nice re-design of the original. 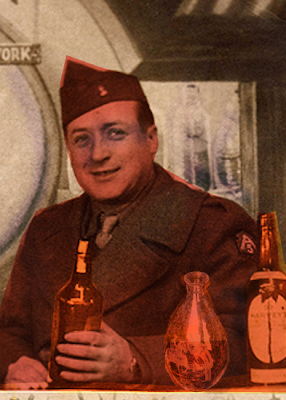 Yeah, I was trying to go for a more positive approach, with a happy lad in his war uniform enjoying a good dose of social drinking. And I went for a more nostalgic photograph to reference the time period of the decanter, with a seemingly well-off man who would probably be using such a fancy decanter.